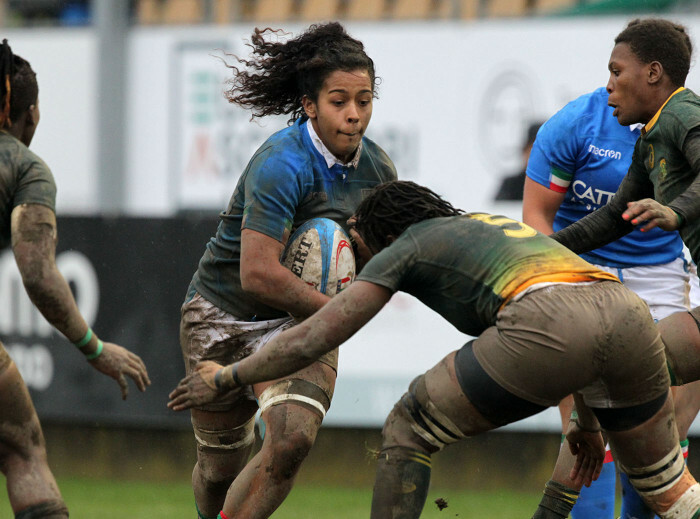 Italy dominated the final test of South Africa's European Tour, winning five tries to one, 35-10. Andrea Di Giandomenico's Italian team closed their November season unbeaten, beating South Africa in the first test-match between the two nations, 35-10 at the "Chersoni" in Prato. Furlan and her companions, after their 38-0 win against on Scotland three weeks ago, confirmed their progress and seventh place in the world rankings controlling the game in the manner already seen at the beginning of November in Calvisano against the Scots. On a rainy and cold day that affected ball handling for the entire match, Italy kicked off ad were driven onto the backfoot by South Africa. They went on the offensive from the start and after 5 minutes Mpupha crashed under the posts to lead 7-0. The home crowd did not have wait for the Italian reaction, which came just two minutes later, with a break by Stefan following a scrum after the restart. Sillari missed the conversion but the Azurri continued to attack that leads to a penalty after 15m. This time Sillari was on target and Italy lead 8-7. After 22m another a penalty by Sillari in front of the posts extended Italy’s lead 11-7. After 32minutes a yellow card was awarded to South Africa’s Nel, for a high tackle, and more Italian pressure on 40 minutes lead to a second Italian try, Giordano touching down after a 5m scrum giving Italy a 16-7 at the break. The second half began with South Africa on the attack, winning a which converted to narrow the Italian lead. Italy moved onto the attack again, without finding a way through the defence but gaining a series of penalties for the indiscipline from their opponents that lead to the second yellow card for South Africa, with Horne sent to the bin in the 55th minute. A series of pick and goes took the home team in their opponents 22, quick hands moved the ball to the wing for Stefan who crashed down by the flag. Italy remained in command and a break of Franco and lead to a series of scrums in front of the Springbok posts, which eventually resulted in a the referee giving a penalty try to take Italy to 28-10 after 65 minutes. Another tr for Italy arrives from Arrighetti at 74m was converted by Sillari. The final few minutes saw the ‘boks test the Italian defence, but it held and the match ended with Italy winners by 35-10.